Calcaneal Bursitis : Balego & Associates Inc. - BalegoOnline.org, Providing the Products You Want and the Services You Need Since 1984. There are two bursae located near the calcaneus. The retrocalcaneal bursa is located between the anterior surface of the Achilles tendon and the posterior superior angle of the calcaneus. The calcaneal bursa lies between the inser­tion of the Achilles tendon and the overlying skin. 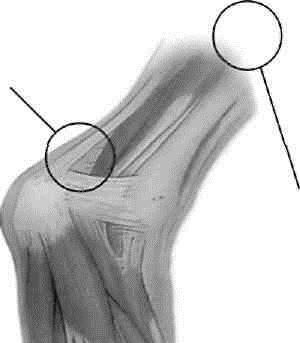 Both bursae can become enlarged or inflamed due to damage of the tendon or excessive pressure in the area. The calcaneal bursa, located just under the skin, is most commonly enlarged and usually gets inflamed because of oversized or tight shoes, especially high heels. It can be palpated by lifting the skin posterior to the tendon. The result will be that the calcaneal bursa lies directly between your fingers. The retrocalcaneal bursa is located by pinching the soft tissue anterior to the Achilles tendon. If there is any palpable thickening, or the patient complains of tenderness in either bursa, this is a positive sign of bursitis. Bursitis here is more serious and usually caused by overuse. There currently are 665 guests online.